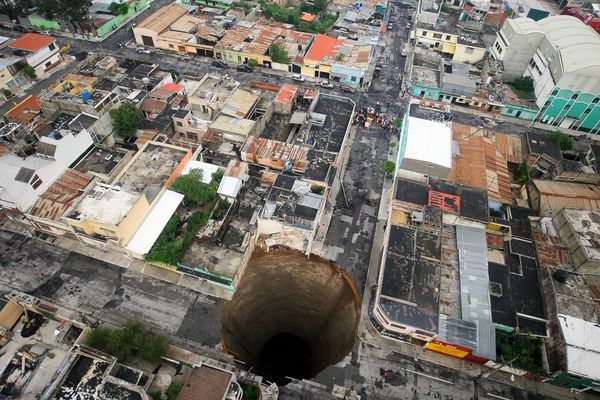 I wrote a brief post Wednesday on platform risk (in a nushell, when you building a gigantic mansion and then discover the land you've stuck it on is a giant sinkhole). There were two big takeaways. The first is that platform risk is more prevalent and you think, and doesn't just affect small software devs. The day Microsoft rolls out its own-label Windows Phone, is the day Nokia finds it suddenly has an awful lot of platform risk. The second is that that platform risk isn't the real problem. It is merely a symptom which arises when you have an unstable relationship between the platform owner (e.g. Facebook, Apple, Google) and the "platform rider" which works on top of the platform (e.g. Zynga). I want to expand on the second point, and show how looking at different types of platforms can guide your investment decisions. As a rule of thumb, in earlier stage and/or higher growth platforms, the balance of power sits more with the platform owner (think Facebook's pretty much arbitary power over its platform), while in more mature platforms (where the legacy ecosystem matters more) the platform riders have more say (think the lower growth Windows desktop market). In essence there is a trade-off between growth prospects and stability. Ideally there is a tension here, where the platform is growing handsomely, but the platform owner isn't being too greedy. However its when this tension falls out of balance that platform risk arises. Closed Platforms (Facebook, iOS, Windows Phone): These are owner-dominated platforms where there is significant platform risk. The trade-off for the platform rider is that these are also high growth platforms. The bottom line is that there is often nice growth that lifts all boats, but a small but material chance of platform risk. Open But Bominated Platforms (Android, Force.com): These are growing platforms where the platform owner doesn't quite has as much dictatorial power. This can be for structural reasons (e.g. Android's open-source nature which means that platform-riders retain the nuclear option of forking, something we are seeing with the Kindle Fire or Baidu Yi), or because the platform owners are not big enough to drive growth on their own (e.g. Salesforce is relying on its ecosystem on Force.com to fill in some of the gaps in its application portfolio). Mature Platforms (Windows, Linux, OSX): These are older platforms which offer a large market opportunity, but one that isn't growing as fast. Because a lot of the attraction of the platform comes from the existing ecosystem, the platform vendor is unlikely to break backwards compatibility with the platform riders in a major way (e.g. Microsoft ensure Windows 8 includes a kludgy legacy desktop mode). 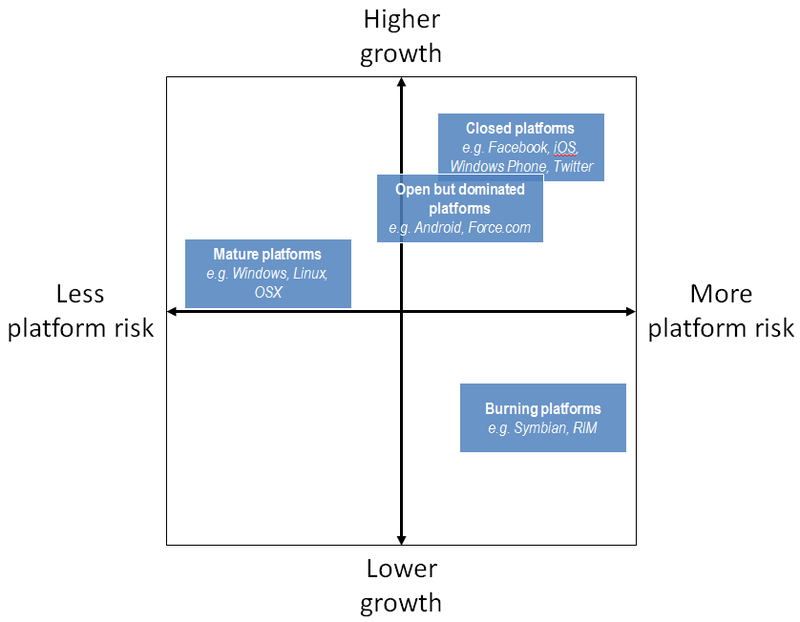 Burning Platforms (Symbian, RIM): These are dying platforms which present massive risk of platform decline. Thankfully by this point any platform rider with two brain cells has already left the building by the nearest fire exit. Platform rider: This is a satisfactory place for the platform rider to be, as they benefit from the rising tide of growth. However there are two big caveats - 1) the coolest platforms attract the most competition (as thousands of failed iOS devs have found out), 2) there is occasional, but massive, PLATFORM RISK. Investor: Buy into the platform owner, but avoid investing in platform riders. If the platform is successful, the majority of profits accrue to the platform owner anyhow. If the platform rider is big enough to be worth investing in, there is a greater chance they would have drawn the attention of the platform owner and be vulnerable to platform risk. Platform owner: The economics are good for the platform owner. Although they don't have the optionality they get from being a dominant position, they benefit from good growth. More importantly, platform riders are more likely to want to play in their garden because of the lower platform risk, and thus do more of the legwork in terms of driving growth for the ecosystem (translation: Platform owner might get a higher ROIC). Platform rider: This is the ideal platform to work on as they benefit from growth but have only limited platform risk. Investors: Buy into both the platform owner and any investable platform riders. Both should benefit from rising volumes and favourable pricing, which will help defend profitability. Platform owner: Economically speaking, this is the best position. While you don't have the explosive growth, a mature platform generates incredibly high cashflows (viz Warren Buffet's comments on Microsoft back in 1997) for minimal new investment. That is pretty much the ideal business model under any economic conditions. Platform rider: This is a good place to be in if you already have an established position and franchise, given the minimal platform risk. However the one caveat is that competitive pressures are likely to be higher, particularly if you lack a killer USP. In the absence of growth and differentiation, your competitors will find the only tool they have to compete with is price. Investors: It makes sense to hold shares in the platform owners as a long-term holding/dividend play. Over the course of time you will make an enormous cash return. One safety warning though - such stocks are often under-valued by the market (particularly in tech which has the strange obsession that more expensive growth stocks are more valuable. In reality they are more expensive, but not always more valuable! ), so don't expect to make a quick profit. Platform owner: Bad for the platform owner. Doubly bad as the temptation for them will be to double down in an attempt to turn things round (translation: burn a few more barrowloads of cash) rather than admit defeat. Platform rider: Has already left the building. Investor: Short the hell out of the platform owner. And stay short (give or take dumb-acquirer M&A risk). Of course the juiciest investment opportunities come when platforms change - that's when you have the cataclysmic shifts in industry economics which are one of the most fascinating features of tech (something I've touched on before here and here). By far the most common example is of platform decline. A good one going on at the moment is the shift from PCs towards tablet. This imperils the whole Windows 8 ecosystem (at least on the consumer side - enterprises are much more resilient). This puts a lot of platform riders in a very uncomfortable situation, both on the software and the hardware side. Normally they should be running for the exits but sometimes they weight of their legacy business means they can't (two words: Innovator's Dilemma). AMD/ATI (which had a cute warning last night) is a good example of this - first the shift from desktop to notebook brutalised ATI's market for discrete CPUs, then as the world shifts towards low-power and tablet they have again been caught short. Logitech's keyboard/mouse business may also be caught in the same trap. Apple (and Google's) moves towards the world of a connected TV (which I wrote a series on earlier in the year) is another example of a potential platform shift. That's all. Enjoy the weekend! Thank you for a great article in explaining the main tech platforms and eco systems. It will allow me to filter out a lot of noise in the tech news press and it clarifies a lot of issues. In terms of books its often tough to find good big picture stuff. Partly because the space is dominated by mgmt gurus pushing their latest HBS piece, and partly because by the time its in print its outdated! - Nick Carr's The Big Switch (http://www.nicholasgcarr.com/bigswitch/) is the best, most elegant explanation I've seen about how cloud platforms are changing the compute world. I don't know if his electricity analogy is original, but its a very good one. - Thinking about more fundamental competition issues, I've always found Andy Grove's One The Paranoid Survive an awesome book about the cutthroat forces that drive the tech industry. Whilst writing about platform riders / platform providers I found myself unconscious slipping back to his 1996 analysis of competitive drivers and "complementors". And as a bonus its written not by a mgmt guru but by someone who's been out there and done it. In terms of websites I don't think there's any one place that nails all these themes perfectly. Check out my blogroll for some of my favourites. Ritzholz is a good aggregator for interesting tech/investor stuff. I do love Anandtech for THE BEST in-depth analysis of the microprocessor/SOC wars. I get my fix of consumer tech news from Theverge.com. I have just gone through all your posts on your blog today...a very enjoyable read...the most intriguing thing I found was the section about Bloomberg competing with their customers in doing research on the sell side and the fact they may be able to specific targeting on the most likely customers for stocks better than anyone else. How do you forsee analysts differentiating themselves in the future? What about the new visual analytics firms such as Qlikview, Tableau, Spotfire etc. In enabling analysts to differentiate themselves? Good to hear that. Had a quick run through my Amazon wish list - not strictly tech but as an analyst I'm also interested in Nate Silver's Signal & Noise http://www.economist.com/node/21564181 ; also want Chris Anderson's book on Makerbots http://www.amazon.co.uk/gp/product/184794065X/ref=ox_sc_sfl_title_1?ie=UTF8&smid=A3P5ROKL5A1OLE as I think the democratisation of CNC manufacturing is going to be a revolution. Yes I was quite pleased with the Bloomberg stuff. I mean to write a follow-up on this at some point. One idea buzzing round my head (which speaks to your question) is that there is a divide between quantitative/process driven analysis and qualitative/relationship driven analysis. Bloomberg are moving forward frighteningly fast in the first category. They not only leverage the cloud platform/reach but are pushing into the big data side - note their recent acqn of Polarlake. This is their edge vs the banks. The banks home court is qualitative and relationship-driven analysis, and they will believe this is their trump card. BBG certainly don't get the relationship-driven culture of wall st yet, and I think are trying out various models to work round that (partly in-house, partly outsourced). But the current crisis is a good time to recruit wall st refugees who "get that". So research and services based around either subjective analysis/judgement which is less vulnerable to being cracked by monte carlo, or where being able to trust your counterparty is the most important thing is where banks have an edge. (still forming my thoughts here... so conclusions all a bit fluffy here I know). I guess advanced BI/big data forms like QLIK, Spotfire et al are the surrogates banks can use to take on BBG in the quantitative/process driven world. One thing I would say though - in my experience banks are horribly bad at using third party apps/services in the front office (back office probably better - but also not perfect check out the problems the Lodestone foundation has been trying to solve). I lose count of the number of times I've been forced to use a crummy homebrew CRM system when they should have just gone for Salesforce. I think this cultural issue is the biggest block to them fully expoiting new visual analytics. In regards to predicting the future of technology I have come to the conclusion that you cannot predict with sufficient certainty anything at all. I think the above book is the most important Business/Management/Startups I have ever read. The above books and info is what crystallized my opinion on how risk and markets are assessed and the numerous pitfalls that await you. Mr Bloomberg is way ahead of the curve ;-) or is he doing his Major duties due to Makerbot being a NY startup. I completely agree with you on the follies of prediction. The unspoken assumption in virtually all forecasts is that "we assume that if there is a discernable trend in this historicals this will continue in the future". You see this all the time in stock market analysis - a favourite trope is "stock / margin went down to x last downturn therefore x is a good floor this time round". The best argument against that is the chart of a Turkey's quality of life in the Black Swan book. The bottom line is there are too many uncontrollable variables. If you showed a structural engineer the amount of inputs (and the impact they have on the result) which goes into a bog standard DCF model they would be horrified. Black-Scholes is another notorious culprit - its sensitivity to the VOL input means it all it serves to do is quantify your existing view on volatility. One way round it is to use scenarios - think about worst/best cases and figure out what the risk/reward ratio is. Keep a consistent framework but vary your inputs. Of course this is also hostage to your unconscious biases when you set your scenarios, but at least it lets you kick the tires on the extreme outcomes. As you said, Nicholas Taleb is great on this sort of stuff (although I much preferred Black Swan over Fooled by Randomness for some reason). re: CNC I always mean to get a makerbot... but they always seem to have a better model coming out in the next few months! Keen to avoid the curse of the first mover (I remember I splashed out far too much for the original Creative Nomad Jukebox back in 2001... in retrospect should have waited for the iPod! ).